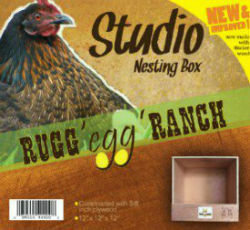 This nest box is the ideal for your chickens. The 12" x 12" nesting areas give chickens the perfect amount of space and privacy, allowing for maximum egg production. Using a clear nontoxic wood preserver initially and annually will help your nesting box maintain a much longer life. A fun family project to take home and assemble with the kids. Built with 3/8" plywood and secured with wood screws. This economical nest comes unassembled. Easy 5-minute assembly - Phillips head screwdriver is the only tool required for assembly.